Let pets take part in the wedding day celebration! 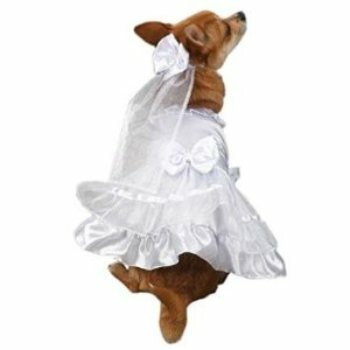 This exquisite white satin bride dress for girl dogs costume includes a coordinating headpiece with an adjustable, easy fit strap. A stunningly detailed dress for the doggie bride-to-be. White satin dress features ruffled trim, a skirt with an elegant organza overlay, and a large satin bow on the back. The coordinating headpiece features an organza veil and a satin bow. Headpiece has an elasticized chinstrap for easy attachment.